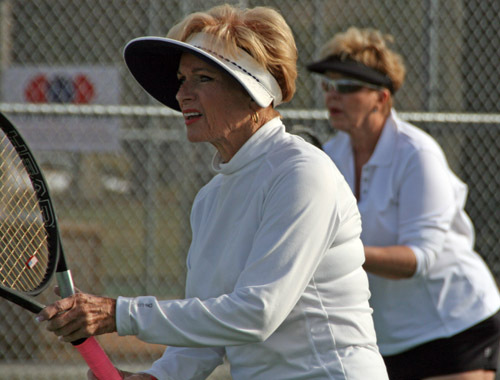 Being doubles partners for 37 years almost, Maryann Mitcham and Anne Alpeter have shared more than just a common bond and love for the game. They've found that a great pairing on the court works pretty good off it, too. 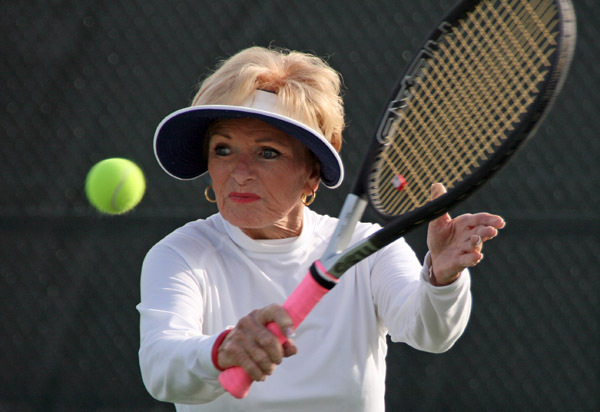 These spectacular Scottsdale septugenarians are in town in Albuquerque this weekend for the USTA Southwest Super Senior League Section Championships, representing the Phoenix USTA Central Arizona area in the 8.0 women's division for what Mitcham said is the "umpteenth time" at a Southwest event. Though the Alpeter-Mitcham pairing may be among the oldest on paper in the women's tournament (Mitcham turns 77 on Sunday, Alpeter is 70), they sure don't look it. It also doesn't take long to see their sweet swings and their ageless attitudes are giving Father Time one helluva' battle. The pair met in Scottsdale back in the early 1970s, as opponents in practice first before they were friends. But their take-charge attitudes on the court made for an auspicious beginning, at least in Alpeter's recollection. "I wasn't wild about Maryann at first," said Alpeter (pictured right) laughingly. "She was always such a great player and the party girl, I'm a little more conservative and Suzie Q-zie. I think I just loved to compete and Maryann can really do that, so I think that's where we really fit in so well. She was a better player than me even though she was older, and that definitely came as a challenge to me." It didn't take long after that first introduction as opponents in that practice match for the two to see they actually made a great pair on the court either (they've never officially played against one another in a tournament). Their regular practice singles matches fueled each other's competitive streaks, rounded out their games. Most of all, it built up an immense respect for each other as competitors and friends. Those singles matches turned into a 30-year Sunday morning ritual between the two that only recently was broken. Mitcham likes to kid Alpeter about breaking it because she got remarried to a man who wanted her in church more than on the court on Sunday mornings. "We are both the in charge types and we have our moments," said Mitcham (right), who was the first original member of the Scottsdale Athletic Club. "It's kind of funny to hear our opponents asking about us sometimes though, if we are arguing at one another. No way, it's just how we are. We don't ever let anything get in the way of our goals on the court." While Mitcham says "we play totally different," it's obvious the two share a deft touch around the net and an intuitive feel for court positioning. They also possess the singular trait that makes for all good doubles teams, knowing where the other is or needs to be at any moment. Even though they routinely spot a combined 20-plus years to their opponents (even in Super Seniors), it doesn't seem to make much of a difference. Aging up hasn't stopped the 'W's' from piling up. Age it just a number to these two, and skill is skill at any age. This weekend in Albuquerque, their skills have been on display, helping lead their 4.0 squad to a 3-0 record through Sunday, just a couple of matches away from a Nationals appearance that is almost the norm for them (the two were on a Super Senior team in 2007 that finished as runners-up in the nation). The Alpeter-Mitcham pairing even handed out a double bagel 6-0, 6-0 victory on Saturday for good measure. Trips to Nationals and tournament victories aside, the girls have had each other's backs in their personal lives as well. Sharing thousands of hours on the court tends to do that. It lends a closeness, an unspeakable bond that them into fierce competitors and teammates as much as it did lifelong friends. "You know we've helped see each other through... just about everything," said Mitcham. "Marriages, divorces, deaths in our families, kid problems, injuries (Mitcham had a knee surgery a couple of years back), you name it, we've talked about it and gone through it all. And probably always will." The funny thing is they're just as chatty on the court as they are off of it. Mitcham is an over-communicator on court, providing commentary and directions (a lot of yes's and yours). And location or timing doesn't ever stop either from giving or getting a playful ribbing from the other. "She's the bawdiest lady I know, she's the Mae West of the Phoenix tennis crowd," said Alpeter, laughing at Mitcham's love of the social scene in tennis. 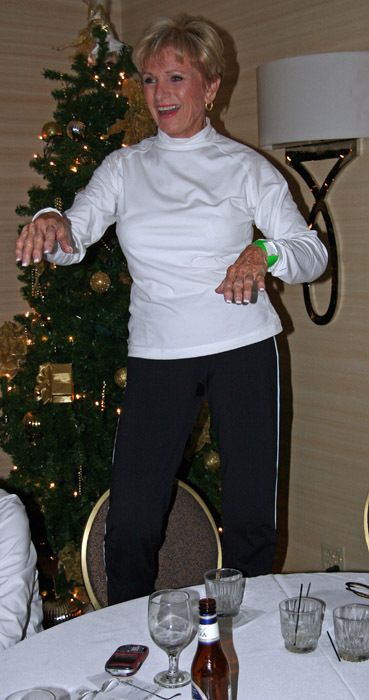 "The stories about her being up on tables at parties are well known. But everyone knows and loves her, and I do too. She's just a great lady." Added Mitcham: "She's been a great friend. I don't think we'd know where we'd be without tennis."